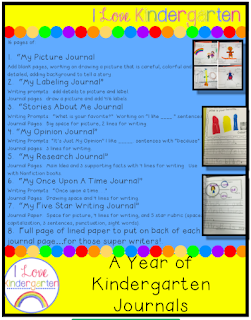 My goal, with all of the journals, is for my kindergartners to write about things that are important to them, and topics they are interested in. Choosing their writing topic is the hardest part of the writing process for some students, but I love what happens when they discover their "voice" and share with me their excitement in our writing conferencing together. Our first few pages in each of the journals, however, I pick the topic. It helps us get the basics of what each journal is about down before we get more creative. Our Research Journal is our nonfiction journal, and helps us get to our final goal of writing 3 sentences. The format or "main idea and 3 supporting facts" is familiar for my students. We use the same organizer in the listening center, when we listen to non-fiction books. I make sure to introduce that listening center response sheet a couple of weeks before we introduce the journal. I've also been using it with my guided reading groups for a couple of weeks. When I introduced our new journals on Monday, they were very excited to see what they looked like, and immediately made the connection. Our first day, I read a very simple nonfiction book about baby giraffes. I then showed them (with much fanfair!) the first page of the journal, and modeled what I wanted them to do. We talked about what the main idea of the book would be ("giraffes!" "baby giraffes!") and I wrote that in the big circle, leaving room for a picture. We then talked about 3 facts we had read in the book, or facts they knew about giraffes. In the small circles, I wrote "milk" (the book talked about how the mama giraffe feeds her babies), leaves (the book discussed how they eat leaves when they are older), and tall (we talked about if someone-like an alien- had never seen a giraffe before and we wanted to tell them about it, the first thing we would say is it is tall). 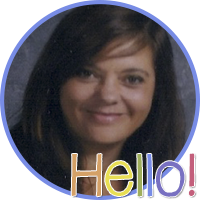 I then wrote my 3 sentences, making sure to model capitalization, sounding out, and periods at the end of each sentence. I wrote "Giraffes are tall. Baby giraffes drink milk. Big giraffes eat leaves". I then turned off my projector, and passed out their new journals. They've come such a long way this year! So proud of them!! !